GST-1 PUT YOUR ADVERTISING ON THE PVC RAIN COAT + A UMBRELLA. WE THINK DIFFERENTLY TO MAKE YOUR PRODUCT MORE ATTRACTIVE AND DIFFERENT THAN OTHERS. 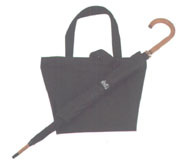 GST-3 PUT YOUR ADVERTISING ON THE TOTE BAG AND UMBRELLA AS A GIFT SET. GST-4 WHO WILL HAVE SAME GIFT SET AS YOU IF WE ASSIST YOU TO MAKE THEM FOR YOU ?! CREATE A NEW PRODUCT LINE FOR YOUR PRODUCTS. 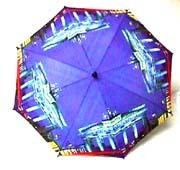 PUT YOUR COMPANY UNIQUE IMAGES ON THE UMBRELLA BY USING HIGH QUALITY OFF SET PRINTING TECHNIQUE. EVERYONE MUST ENJOY YOUR IMAGE DURING RAINING DAY. 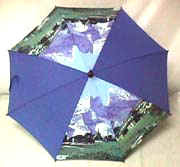 GOLF UMBRELLA SET COULD BE CONSIDERED !! 30"x8 fiber glass shaft & ribs golf umbrella with special hand crafted wooden gold handle, + 3 pcs golf balls + a TOWEL in a elegant gift set box.